In Belgium, several rare and protected species benefit from habitats generated by mining activity. This is the case, among others, for the sand martin, lizards, wall lizards, natterjack toads or typical algae typical of poor environments such as characeae. Creating temporary ponds, along with their regular refreshment, allow the development of targeted pioneer species, in particular, amphibians (Natterjack toad), dragonflies and water birds. The creation and annual refreshing of soft sediment banks ensure the maintenance of suitable habitat for sand martins and solitary bees. Installation and dynamic management of shelters by stacking rocks or wood debris in open grounds enhances the hosting capacity of quarries for reptiles, amphibians and insects. Chalk and siliceous screes are important foraging grounds for reptiles, such as the smooth snake and the common wall lizard. A pluri-annual management scheme allows the maintenance of variously aged scree in active quarries. Large stretches of quarry water allow creating rich habitats which provide food and nesting resources for a wild variety plant and animal species, such as the great crested newt and the Midwife toad. Installing floating platforms on large quarry lakes could generate attractive zones for bird species such as the common tern or the common gull. 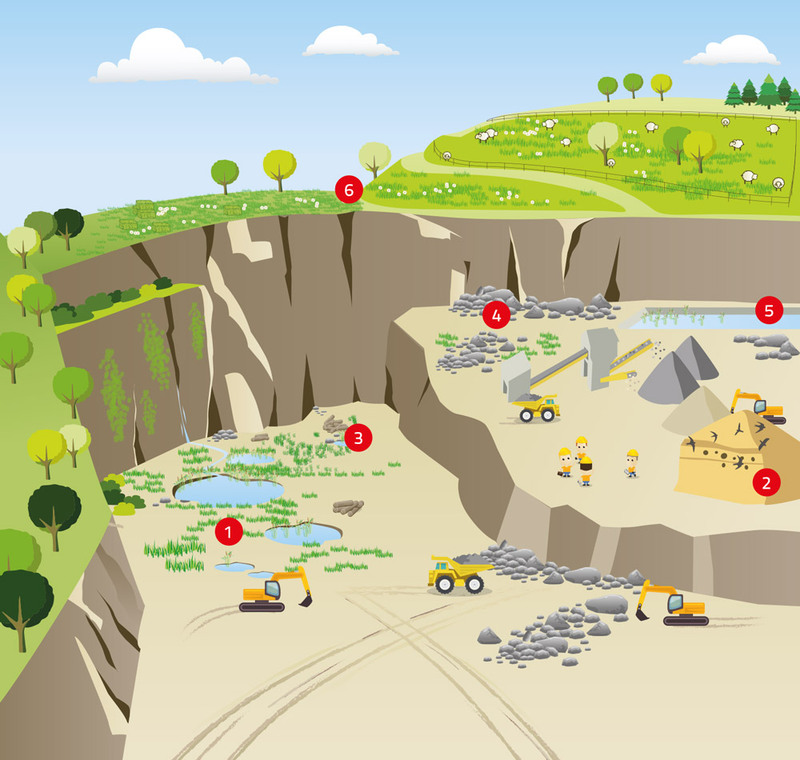 Quarry dependencies constitute a significant opportunity for restoring dry and flowered grasslands, maintained either by late-mowing or grazing.